LOS ANGELES, Sept. 13, 2018 /PRNewswire/ -- MOBILE WORLD CONGRESS AMERICAS -- At Mobile World Congress Americas, Wi-Charge and ZKTeco USA are providing a glimpse into the future of smart locks by showcasing a unique integration of a high-end multi biometric door lock with the Wi-Charge long-range wireless power receiver. "We are pleased to show yet another facet of what meaningful wireless power can deliver," says Yuval Boger, CMO, WI-Charge. "Smart locks as well as other security cameras, sensors and other smart home devices can greatly benefit from everlasting batteries. Consumers no longer need to worry about being locked out of their homes." "At ZKTeco USA we are always looking at new ways to improve the customer experience, to enhance security while delivering peace of mind and convenience," says Manish Dalal, President and Founder, ZKTeco USA. "The convenient, stable and meaningful power that Wi-Charge delivers is an excellent building block for next-generation access control solutions." 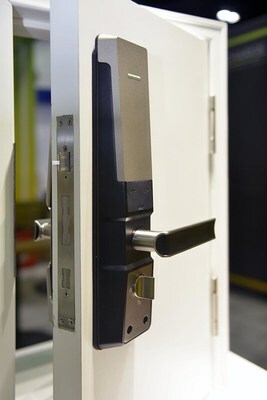 The wirelessly-powered smart lock can be seen at the Wi-Charge booth at MWC, South Hall, Booth 1566. Wi-Charge is the long-range wireless power company, founded with the goal of enabling automatic charging of phones and other smart devices. Our patented infrared wireless power technology can deliver several watts of power to client devices up to 10 meters away. The company developed remote charging solutions that enable mobile and wireless devices to seamlessly recharge themselves without user intervention. For additional information, please visit http://www.wi-charge.com.